A truly wonderful rum which is simply too expensive for regular drinkers, in spite of its quality. It’s just too out of reach for us proles, alas. “I have left instructions in my will,” growled Kanflyer on the Ministry of Rum, echoing the sentiments of many, “For my grieving (?) widow to take the insurance settlement, find a bottle of this and toast my memory with my friends…both of them. There is no way I could spend $5k on a bottle of rum while I’m still kicking around.” In two humourously pithy sentences Kanflyer (may his glass never be empty) encapsulated the rank and file’s opinion on Appleton’s most heavily hyped and most expensive production rum ever, the Independence Reserve. 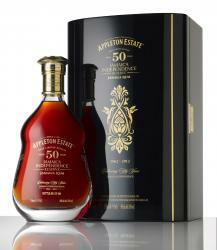 Appleton’s 50 year old Jamaican Independence Reserve rum is so audacious that when I call it a vanity project, all you can really do is admire a company crazy enough to make it. Even with its vanishingly small production run of eight hundred bottles, you have to concede that here’s a product that really has no reason to exist at the price point of US$5000, which puts the 58-year-old Longpond at one fifth the price to shame. The cost of this one bottle is high enough to make me a small one-man special interest group with some hefty clout in the capital. For the price, I could fund the Whisky Pilgrim on ATW for a decade, buy enough Bacardi to keep me drunk until the Rapture, all the Renegades that will ever be made and just about all the El Dorado and Rum Nation rums currently in production (maybe twice). Quite frankly, there’s nothing that I know about to which I can seriously compare it unless it’s the 37 year old Courcelle from Guadeloupe, or the 58 year old Longpond from G&M (and frankly, I really wish people would stop saying that the 50 the oldest rum available in the world, because even if the Longpond isn’t the only other one, the fact that it’s there at all put a lie to Appleton’s press statement). So it’s perhaps almost anticlimactic to discuss the characteristics of the rum (I was given a sample to try by Andrew of the KWM and had it again – twice – at a tasting event), but let’s forge on regardless. The nose of the dark copper fifty year old began with notes of hay and grasses, and dark brown sugar melting in the tropical heat. Freshly cut tobacco leaves, raisins, a hint of cherries. My seven year old, who wanted to know what Daddy was doing, sniffed, opined “vanilla” and walked away. But what coiled out and took over the balance was a kind of luxuriously heavy honey scent that really was quite heavenly. It blew away the thirty year old like yesterday’s news. Distilled from molasses and aged in the standard used oak barrels, the rum is a blend of twenty rums whose minimum age is fifty years. Distilling it to 45% was the right decision, I think – had it not been a little overproofed, I doubt I would have enjoyed it as much (I was tasting it with the Appleton Reserve, the 21 year old and the 30 all together). It had a medium body, and arrived with a luscious taste of fresh honey and nuts (no, not Cheerios), and had a deep and dark mouthfeel like velvet, no sting or bite, just a warm, slow heat that gradually revealed notes of cinnamon and lemon zest. Yes there were oaky notes on this baby, just not as evident and unwelcome as the thirty turned out to have, and just the right amount of sugar in the rum gave it an excellent and harmonious balance. The fade was long and lasting, redolent of leather and smoke and a faint nuttiness. An excellent – no, a phenomenal – product all around, and while it may not be worth every penny of five grand, if you can get a taste, don’t pass it up. Here’s the thing. It’s a good rum, a great rum…perhaps even brilliant one. Appleton have somehow managed to weed out the overbearing oakiness that to some (I have gradually become one of them) marred the 30 year old. It may lack the stern, uncompromising beefiness of cask strength offerings I’ve been sampling recently, yet the 45% strength is good for what it attempts, which is to be intense, flavourful and a damned good drink. I liked it a lot. It handily shows any 46% Renegade Rum the door. But I honestly don’t know who is supposed to drink this rum, because at close to $200 per shot, I know I couldn’t, and actually, I’m not even convinced it is meant to be anything other than a collector’s piece for oligarchs, politicians, ambassadors, industry CEOs and the rich and powerful (and crass). Even Joy Spence remarked “This will emphasise the ‘premium-ness’ of Appleton. It’s a halo for the other brands of the estate to bring them up.” So it’s an advertisement rather than something for wide distribution, the way the Nikon F6 film camera is…great stuff, far too pricey and ultimately, kinda useless. This is a luxury rum on steroids, a sort of flagship marquee that bellows “Here I am!” to the world, like a pig-ignorant over-decorated geriatric driving a Lambo, ostentatiously tooting the horn at a traffic light. It’ll provide the company, marketers, bloggers, reviewers and its fortunate owners with exactly what they desire, yes: but whether it’s exactly what they deserve…well, that’s quite another matter. This rum review was long enough that I didn’t bother describing the presentation – I justified this breach of reviewing etiquette by telling myself that every press release and news article has already mentioned it, so I didn’t have to. I may change that in a while after my backlog is taken care of. Wait a while…I read in a Jamaican paper that Appleton is going to produce a 100 year old rum in 2062. Pardon me if I don’t start saving for that.